Today, Pride events (festivals, marches and parades) are celebrated by many walks of life, gay and straight, in communities all over the world. This shows the overwhelming acceptance of the Lesbian, Gay, Bisexual and Transgender (LGBT) community. But Pride events, particularly the Pride march, started as public demonstrations in taking a stance against the discrimination and violence that was shown toward the LGBT community. The Pride march was intended as a promotion to LGBT self-affirmation, equality, dignity and acceptance, and to eliminate the social stigma surrounding the LGBT community more than 30 years ago. The start of the Gay Rights Movement began following the 'Stonewall Riots' in New York City in the early morning hours of June 28, 1969. It was called the 'Stonewall Riots' after the Stonewall Inn on Christopher Street in the Greenwich Village neighborhood of New York City. The Stonewall Inn, which was owned by the mafia, was an openly gay bar that catered to an assortment of patrons, but which was popular with the most marginalized people in the gay community: transvestites, transgender people, effeminate young men, male prostitutes and homeless youth. Very few establishments back in that time welcomed openly gay people. During the early morning of Saturday, June 28, 1969, police raided the Stonewall Inn, but quickly lost control of the situation and a riot broke out in response to the police raid. "That the Annual Reminder, in order to be more relevant, reach a greater number of people, and encompass the ideas and ideals of the larger struggle in which we are engaged - that of our fundamental human rights - be moved both in time and location. We propose that a demonstration be held annually on the last Saturday in June in New York City to commemorate the 1969 spontaneous demonstrations on Christopher Street and this demonstration be called CHRISTOPHER STREET LIBERATION DAY. No dress or age regulations shall be made for this demonstration." “Christopher Street Liberation Day” (CSLD) commemorated the police raid on the Stonewall Inn. One year following the Stonewall Riot, the very first Pride march was held on June 28, 1970 and covered the 51 blocks from Christopher Street at the Stonewall Inn to New York’s Central Park. The march took less than half the scheduled time due to excitement, but also due to wariness about walking through the city with gay banners and signs. Although the parade permit was delivered only two hours before the start of the march, the marchers encountered little resistance from onlookers. Fred Sargeant, as was mentioned previously, one of the people who proposed the first Gay Pride demonstration, marched in the CSLD on June 28, 1970 and wrote a first person account of the march for the Village Voice in 2010. “There were no floats, no music, and no boys in briefs" explains Sargeant. The first Gay Pride demonstration was more of a sombre event where participants held signs and banners, and chanted: “Say it clear, say it loud. Gay is good, gay is proud.” This was long before anyone heard of a Gay Pride March. Pride marches were originally intended to show respect and commemorate the Stonewall Riot and the history of the Christopher Street Liberation Day. In subsequent years, marches lead to parades and various Gay Pride events. They have evolved into pure celebrations, putting the LGBT community on cheerful, proud display. Thankfully, more than four decades after the Stonewall Riot and the first Christopher Street Liberation Day, we see widespread acceptance of the LGBT community and support of their human rights, including the legal right to marry. This is evident from the crowds full of people from all walks of life, cultures, all ages, politicians, community leaders and families participating in Pride events. Pride marches and parades are now held around the world celebrating the history, courage, contributions, diversity and future of the LGBT community. Unifor issued a statement following the horrific Orlando shooting, stating that it stands in solidarity with the LGBTQ community of Orlando, Florida, and suggests that we must "renew our efforts to put an end to hate-based violence and continue to push for stronger gun control legislation." This year as we march in Pride parades, our thoughts will be with the friends and families of those injured and killed in Orlando. We will march not only in celebration of love and equality, but in defiance of hate. 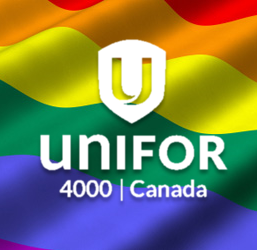 Unifor, Canada's largest Private Sector Union, and Unifor National Council 4000, are both committed to representing all Unifor members and creating safer and fairer workplaces for LGBTQ union members. We are proud to be a union for everyone. Together we stand in Solidarity and Pride.